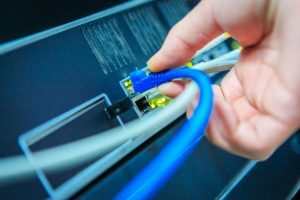 What is SIP trunking from Triad Telecom? SIP trunking is an IP replacement of a traditional, copper telephone line. SIP trunks use your internet connection to transmit voice communications. With SIP trunking, you keep your existing on-premise phone system while saving money on your telephone lines and creating a more efficient method of business communication with disaster recovery built in. Our SIP trunking allows you to preserve your investment in your phone equipment while easily upgrading to cloud based services. You can take advantage of solutions such as our optional advanced call recording feature to record and store calls, and easily access them when needed. In the event of an emergency, power failure, or loss of internet service, calls can be rerouted to another location, a cell phone or voicemail to maintain business continuity. Triad’s SIP trunking is delivered over a carrier-class network to ensure crystal clear HD sound quality. Pursue a cap and grow strategy by networking your on-premise phone system with our hosted PBX solution. You can add new users to the hosted solution to stop capex investment in hardware that is possibly nearing end of life. Contact us today to harness the power of SIP trunking and create a better connection for your business communications that is flexible, cost-effective, and future-proof.